The 1830s is an era of Western fashion that I have generally found mystifying. Poke bonnets, giant sleeves, caplets are all features of this era of historical dress and none of them have ever really appealed that deeply. And yet, I am nothing if not someone who like to learn about stuff and sometimes I try to challenge myself. I want to embrace periods of fashion that I don’t really like all that much and so I found myself deciding that this year, I was going to try out the Romantic period. I would, I told myself, draw a paper doll with 1830s fashions and I would enjoy it! The 1830s are an interesting time fashion wise though. The introduction of the metal eyelet in 1828 means that the 1830s are the first era when corsets were really capable of being laced terribly tightly (metal eyelets can take a lot more stress than handsewn ones) and to make matters more interesting, vulcanized rubber was used in clothing as well for the first time in the 1830s. Innovations all around. The cage carioline which was used to support skirts in the 1860s doesn’t exist yet, so skirts are held out with horse hair petticoats and horsehair sewn in the hems. That means the silhouette isn’t as full as it would become in a few decades. 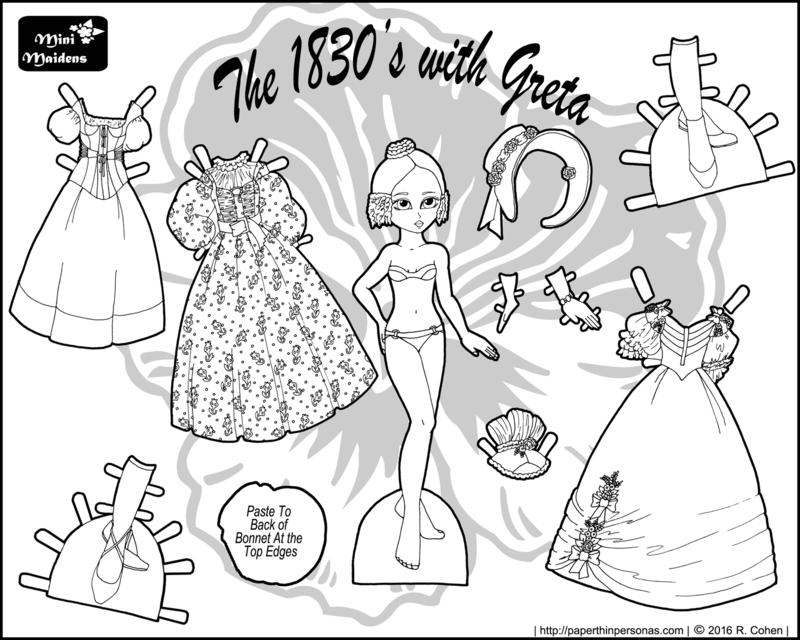 All right, so Greta, the paper doll modeling these 1830s outfits has a full set of underwear from this era which includes a chemise, corset, petticoat and sleeve supports. In order to fill out huge leg-o-mutton sleeves of the era, women used a variety of sleeve supports of various sizes. I made hers small so the underwear could easily layer. She has two dresses. A day dress based on this garment and a ballgown. I swear the ballgown is based on something, but try as I might, I just couldn’t find the reference image I used. So… Trust me? Greta also had a poke bonnet and some false hair styled in the Apollo Knot style. Women in the 1830s went a little nuts in the hair department. See this fashion plate and you know what I mean. I hope everyone enjoys this little foray into the 1830s. This is an era I should stick around with? Drop me a comment and let me know! I like the doll today, but I do prefer the simpler dresses but this is still vary nice. I love this doll. You should totally do some more. My question from the video would be- How do you ink all the little parts and make it look so smooth? Thanks. Oh, that’s a great question. The answer has to do with paper quality, pen nib size and post processing. Might get a post out of that one… Thank you so much! Oooh, I love this doll! It looks like something Beatrix Potter would wear.